This is a RAVE of the O.P.I. 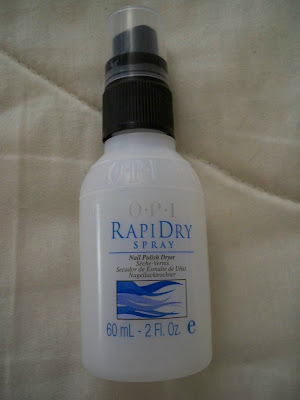 Rapid-Dry Spray for nails. It is essentially a nail polish dryer that is applied onto the nails "45 seconds after the final coat of nail polish." I mist on quite a bit, even probably over-doing it! I'm sure that a single spray on each nail would work perfectly fine, but I tend to do two or even three sprays. This stuff is amazing though. I polish my nails frequently because I don't like the look of chipped polish, and also because I tire of one color very easily. It used to be such a hassle, and even a little time consuming. But I found this product at my local Trade Secret a few months ago, and I cannot be without it! My nails are completely dry after two or three minutes. I am still careful to make sure I don't bump them on anything for a few minutes afterwards, but I think that is mainly due to years of nicking manicures because the polish was still tacky. I must also mention that the smell of this is wonderful! It has a floral scent that I just love. The only downside I find with it is the price. I paid $10.95 for a 2 Fl.Oz. bottle at Trade Secret. However, I was in another beauty supply store just last week and found the same bottle was $8.95 there. I will be repurchasing very soon because I am almost out but I will go back to the store with the cheaper price tag. I highly recommend this product for all the nail polish addicts out there! I'm going to go see the doctor again tomorrow about my hair, and tell him I want to see a dermatologist. Quite a lot of hair came out again tonight, so Im going to skip college tomorrow to sort my hair out. My first encounter with the spray was when i first started my clinical portion of cosmetology school, this was an essential in our kits....so as i did my first set of acrylic nails i proceeded to spray the rapid dry...well i found out very quickly that i was allergic to it as i felt like i couldnt breathe, and my hands broke out in hives. HHAHA from that day on i had to have other classmates spray it for me and i had to be in another room. I then came across the rapid dry top coat which is duel functional.